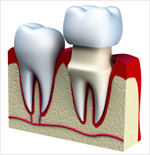 A dental Crown restores a tooth’s natural shape, size, and strength. It fully surrounds the visible portion of your tooth. It can be fabricated from a multitude of materials, such as, Silver, Gold, or Porcelain. Most commonly used to cover a space, if you are missing 1 or more teeth. 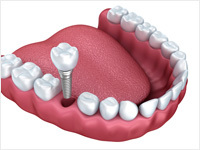 They are cemented to natural teeth or Implants surrounding the space. Bridges help to hold your teeth in place preventing malalignment. Once an Implant is placed by a specialist (Oral Surgeon or Periodontist), the restoration process is fairly simple. After taking an Impression of your Implant for our lab, we attach a handcrafted, permanent crown to each Titanium post (Implant). The crown will match your natural teeth and blend seamlessly with your smile. Dentures are a removable appliance to replace missing teeth and enhance your smile. They are made closely to resemble your natural teeth and improve chewing, speech, and digestion. Complete Dentures are used when all of your teeth are missing. Complete Dentures may be either 1. Conventional or 2. Immediate. Partial Dentures fill in the spaces created by missing teeth and also prevents other teeth from shifting. A conventional type is made after the teeth have been removed and the gum tissue has healed, normally 4-6 weeks. During the 4-6 weeks the patients will go without teeth. Immediate dentures are made in advance and placed immediately after the teeth are removed. 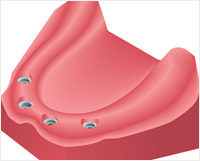 Once tissue shrinks and heals, the denture will have to be relined to fit properly. 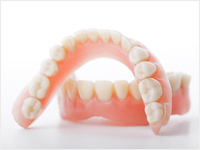 Dentures are very durable and will last approximately 7-10 years. They may have to be remade, repaired, and readjusted due to normal wear. Crowns are very versatile cosmetic/restorative dentistry treatment option. They can be used to cover a natural tooth, a tooth treated after a root canal, or to anchor to a dental bridge. For patients missing all or many of their teeth, implant supported dentures/partials offer a great deal of opportunity. They provide several advantages over conventional methods. We work closely with our Periodontist or Oral Surgeon to design and construct removable partials and dentures that attach directly to permanent Implants. This allows more comfort and stability, as well as, better biting and chewing capacity. Dental Implants integrate with your jawbone, helping to preserve the bone and keep it healthy and intact.